With the July 1, 2015 changes to Kindle Unlimited comes much anxiety among KDP Select authors. But before you press your PANIC button, maybe you should consider this novel idea: Check the numbers. Hover your mouse over Shop by Department, then hover over Books, and select Kindle Books. See the number listed with the Kindle Unlimited filter. Click the Kindle Unlimited filter. Now check the numbers in the categories. Copy/paste the numbers of interest into Microsoft Word, for example. I did that on July 1, and I’ve done that periodically for several months so that I can compare the numbers. There is a lot of talk about authors possibly leaving Kindle Unlimited, but you don’t have to guess. The data is in plain sight. ARE AUTHORS LEAVING KINDLE UNLIMITED? There were about a million books in Kindle Unlimited heading into July, and there are approximately 1,015,000 today (July 3). Of course, this figure is constantly changing. It’s gone down by about 4,000 (out of over 1,000,000) since July 1. That’s 0.4%. A few authors are taking advantage of the early opt-out opportunity, but 0.4% doesn’t constitute a mass exodus. In comparison, over 40,000 books were added to Kindle Unlimited in the past 30 days, and the overall number of 1,000,000 is way up from 600,000 when Kindle Unlimited made its debut one year ago. Throughout the program, KDP Select books have had a 95% (or greater) renewal rate, and overall number of participating books has steadily grown every month. If indeed authors are pulling their books from KDP Select, which books do you think are leaving? Are children’s books leaving Kindle Unlimited? There are 104,441 children’s books in the program as of July 3. There were 104,374 children’s books in the program on July 1. Wait a minute! This number has actually increased. Although some illustrated children’s authors have complained about the recent changes to Kindle Unlimited, books don’t seem to be dropping from the children’s category. Are short reads leaving Kindle Unlimited? There are 354,000 books in the program with 100 pages or less. There were 302,000 in mid-February and 314,000 in mid-March. It has steadily increased. 4% of Kindle Unlimited books had 11 pages or less in February and March, and that’s still true in July. Are self-help books leaving Kindle Unlimited? There were exactly 38,276 self-help books on July 1, and this number is exactly the same on July 3. Are romance books leaving Kindle Unlimited? That’s 865 books out of 89,000 (about 1%). There are still plenty of romance books in the program, of all lengths and subgenres. Over 6,000 new romance books have been added to Kindle Unlimited in the last 30 days. However, Scribd recently announced cuts to romance and erotica titles. Maybe some of those books looking for a new home will try Kindle Unlimited. Looking at all of the genres, I see no significant changes between July 1 and July 3. Will that change? Maybe. But we won’t have to guess. Anyone can visit Amazon and check the numbers. What if a huge number of books pull out of KDP Select? What if a huge number of books pull out of the children’s, erotica, or other categories? What if subscribers cancel their Kindle Unlimited subscriptions because they can’t find the books they want? These are valid concerns. But it hasn’t happened yet. You should keep an eye on the numbers. Then you won’t have to guess or worry. You’ll know. If any of those things happen, you can be aware of it, plan for it, react to it. So far, they haven’t happened, so you don’t need to pull the plug prematurely on your own books. What if the number of books in Kindle Unlimited stays roughly the same? What if the number of subscribers remains roughly the same? What if you earn more money with the policy change than you had been? You should plan for these cases, too. You’d hate to pull out, then find out later that books very much like yours are thriving with the change. Keep in mind that there are about 100,000 traditionally published books in Kindle Unlimited, including Amazon’s own imprints. These books attract readers, and since they don’t adhere to the terms of KDP Select, they will likely stay in the program. 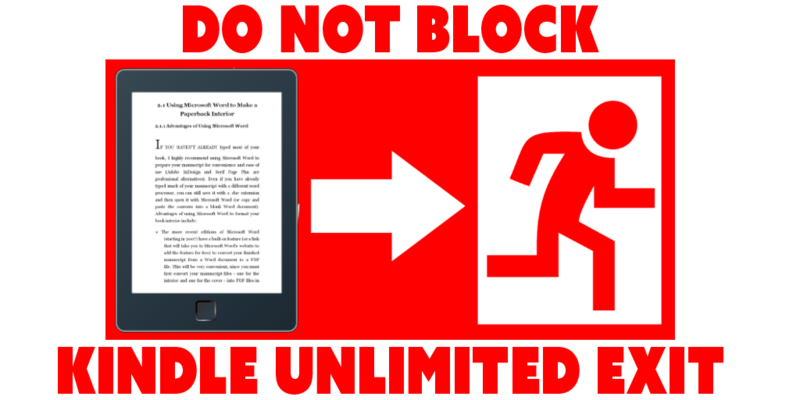 SHOULD YOU PULL YOUR BOOKS OUT OF KINDLE UNLIMITED? Every book is different, so there is no one-size-fits-all answer. First, you shouldn’t compare what you make with the new terms to the $1.35 per borrow read to 10% that you had been earning previously. That’s in the past. The wise thing is to look at what you’re making with the new Kindle Unlimited policy, and compare that with how much you might be losing due to exclusivity. Short books may actually do quite well in the new program. The new terms appear to reward reader engagement. Short, engaging books may be more likely to get read to 100%. Just because a book is short doesn’t mean you should pull it from KDP Select. Every borrow helps your sales rank (whether or not it’s read to 10%). If you leave KDP Select, you lose this sales rank benefit. Some authors who leave Kindle Unlimited see their sales rank slip and blame Amazon for favoring KDP Select books. But Amazon doesn’t need to do anything special to favor KDP Select books. Since every Kindle Unlimited borrow helps sales rank, the benefit is built-in. How much money will you earn with the new Kindle Unlimited policy? According to Amazon, 1.9 billion pages were read through Kindle Unlimited in June, 2015. Amazon is paying $11 million for Kindle Unlimited (and Amazon Prime) borrows in July and August, 2015. …the new program will pay approximately $0.0058 per page. Visit your KDP Bookshelf. Click the Advertise & Promote button. Check what your KENPC is. That tells you how many pages your book is (it’s not the same as what’s listed on your product page, and may be somewhat larger). Multiply your page count by $0.0058. That’s how much you will earn if a customer reads 100% of your book. Multiply this by the number of times your book was borrowed in June. That’s how much you will earn if (A) customers read 100% of your book, (B) you have as many borrows in July as you did in June, and (C) the actual payout turns out to be $0.0058. Since these are three big unknowns, this is just an estimate. The only way to know for sure is to wait until August 15. Another way to estimate this is to look at the average number of pages read per day on your Sales Dashboard (add up the numbers for each day and divide by the number of days), then multiply by 31 (for 31 days in July), and then multiply by $0.0058. However, your numbers are likely to grow for the first several days, in which case the first few days may under-project. If so, it’s better to wait until your numbers stabilize and only use those numbers to project. How engaging is your content? More engaging content is more likely to thrive in the new program. Are customers very likely to read 100% of your book? Maybe it’s a captivating read, or maybe it’s short enough not to demand too long of an attention span. Nonfiction content where customers are more likely to read just a chapter or two will have much lower percentages read. High content engagement may help to offset a shorter page count. A longer page count doesn’t help at all if the readers aren’t finishing the book. What if other authors in your subgenre pull their books out of Kindle Unlimited? Then their readers will be looking for other books to read. If a small percentage pull out of your subgenre, this may help more than it hurts. If there is a mass exodus, well, that might cause readers to look elsewhere. So keep an eye on the number of Kindle Unlimited books enrolled in your subgenre. Then you won’t have to guess whether or not there is a mass exodus. You’ll know. Will your book sell elsewhere? Now this is a tough question, but it’s very important. If you pull out of KDP Select, you’re going to lose the income from Kindle Unlimited borrows. And you’re going to lose the favorable effect that those borrows have on your Amazon sales rank. So you need to sell enough books at other retailers to make up the difference. There is no guarantee that you’ll sell enough books elsewhere to compensate. You might do a little research, visiting Nook, Kobo, Apple, etc. Check out your subcategory there. Especially, how are indie authors faring there? Not all sites are as indie-friendly as Amazon (well, Smashwords may be one exception). Marketing your book at other venues is a different art. Before you embark on this, you want to have a solid marketing plan in place. How much trouble will it be to publish elsewhere? It’s generally not too much trouble if you publish with an aggregator like Smashwords or Draft 2 Digital. Do you have an image-heavy book, such as an illustrated children’s book? If so, you might find that most other sites don’t have such generous limits as KDP has on maximum file size, and formatting may be a little different. If you have a Mac, formatting a picture book for Apple is one option. At least look into the formatting before you make the plunge. What if it doesn’t work out elsewhere? It happens. A few authors leave KDP Select and sell well elsewhere, but many find that their books don’t sell much elsewhere. You might make less elsewhere than you would have earned from pages read. And your Amazon sales rank might slide because you’re not getting those borrows. If you get back into KDP Select a few months later, in the meantime, your sales rank may have slid considerably. I don’t know if it will happen to your book. But it is something you should consider before you make your decision. HOW LONG A BOOK SHOULD YOU WRITE? If you’re going to sit down right now and write 120,000 pages, it doesn’t really matter whether you write 3 short books of 40,000 pages each or 1 long book of 120,000 pages. In the end, if a customer reads 100% of what you write, you earn the same amount of money. It also doesn’t make sense to pad or reformat your book. That nonsense is likely to cause readers to stop reading your book, in which case fewer pages will be read. Write a book that’s more likely to get borrowed. Write a book that’s more likely to get finished. Write a book that’s more likely to compel the reader to read your other books, too. Whatever length of book does those three things best, that’s the length that will be most profitable. Whether that length is 10,000 words, 40,000 words, or 100,000 words, it’s not the length that counts, but those three points above. What length story can you tell well? What kind of story are you interested in telling? Just because a particular length turns out to be most profitable in general doesn’t mean that every author will succeed at writing a story of that length. Some lengths are quite challenging to pull off. WILL KINDLE UNLIMITED ENROLLMENT NUMBERS GO DOWN? Historically, KDP Select has had a 95% or greater renewal rate every month. Over the past year, many authors have complained about scamphlets receiving the same royalty for a borrow as full-length novels. Despite all those loud complaints about shorter books in Kindle Unlimited receiving the same pay, 95% of authors were content enough with those terms to leave their books enrolled in Kindle Unlimited. With the new Kindle Unlimited policy, different authors are complaining loudly. The only difference really is who’s complaining. The complaints have always been there. So it would surprise me if there were a mass exodus now, since there wasn’t one before. Rather, over the past year, the number of Kindle Unlimited books grew from 600,000 to 1,000,000. I expect it to keep growing. But I’ll keep an eye on the number, just in case I’m wrong. Of course, Amazon is watching the enrollment numbers carefully. So if a cause for concern does develop, Amazon will be in a position to act on it and try to keep the program successful. I like your straightforward, data-driven approach to the entire subject of whether authors should continue to contribute their works/keep their works in KU, Chris. The problem is actually this: *Kindle Borrows should be set up to reflect the length of what is being borrowed! * ‪#‎Authors‬ who write longer works (and work harder) should be paid more. –A novel-length “book” needs to be defined. I propose 60K – 80K words as the minimum cut-off for a novel-length book. –Go down by 20K and get a Novella, from 40K – 59,999 words. –Anything shorter than 20K is a short story. Or, come up with a similar schematic, if my WC numbers don’t please you. Like a step program? I think that could work. I had been expecting a change, if any, to base the borrow royalty on the length of the book, but instead it is pages read. I wonder if one reason that it’s not book length is that it reward ridiculous amounts of padding. With this, the focus is on getting the pages read. It seems like everything has its problems; it doesn’t appear easy to find an ideal solution. Seems whenever Amazon does a change, some people scream the sky is falling. Though this pay per page thing is rather strange. Still think it sounds good in theory, but something feels ‘off’. Not sure what. The off part is not yet having a million pages read. That would make it feel much better. But, yeah, my head aches from all the times the sky has fallen. A million pages on your own or overall? It certainly would. That would net me $10, right? Thanks a lot for this! Very informative. I’m missing something. IF your book is pure text, such as a long novel, the KENPC is a fixed fraction of your word count; it would be far easier for many of us to make calculations (especially those of us whose books aren’t up yet), if we knew approximately how many words (or characters) a ‘page’ calbulated the new way has. Do you have a feel for that number? For other kinds of books, especially those which are image-heavy, word count makes no sense. But for regular fiction, it would be an easier concept for most writers than a ‘normalized’ page. If you need something to do calculations with, I’m about to put up a novel of about 150K words (this is me being helpful). So far, the people who’ve read it on my blog and on Wattpad have a tendency to finish the whole thing (lovely people), and I hope that will continue. Not everyone sticks past the first couple of chapters (it is not to everyone’s taste – no book is), but after that, Wattpad produces a graph, and it is remarkably flat. Your presentation of the idea is, all by itself, an antidote to the ridiculous panic floating around the web. It seems to be around 200 words per page for most all-text books, but a few authors have reported significant exceptions. Thanks, Chris – that is a very useful number. Typical word counts for the ‘standard ms.’ one used to submit to agents ran around 250 (so the agent could make a quick estimate – why trust the author? Now that software counts EVERYTHING for you, you can do these computations, and get a good estimate. Pride’s Children, Book 1, will thus be between 750 and 800 est. pages. So IF I put in in there, someone borrows it and reads the whole thing, AND the payout is .006, a borrow would be worth about $4.50. Thanks for all your so useful posts. KENPC uses a very low word-to-page ratio. I had been expecting 250-350 words per page. I bet it’s about perception, to make authors happy to see those extra pages, and also more pages read. It is $%^&# awesome. I’ve been planning to price at 7.99 (I know), run an occasional Kindle Countdown or Bookbub discount, and get on to writing the next, but seeing 7.99 AND having it available via KU will make the KU very appealing (I think) – and I won’t suffer for either. I don’t have the energy to do all the marketing and publicity and everything else you need to do to use advertising, free downloads, and publicity to my advantage. I admire those who do, but after reading the self-publishing blogs for four years, I know I need a different path. This new KU is exactly what I needed to complete my ‘marketing plan.’ I DO think about these things – but you have to take the author and her health into account, too. The next step before publication: finish the Pride’s Children separate website, and clean up my blog. Their passive marketing and online presence have to be good and easier to navigate. I do listen when all you guys speak – and then figure out what I can use and what would be impossible for me. Definitely, you have to plan the marketing not only around the book, but also around the author. You definitely get an A for planning and research. Good luck with your book. Thanks, Chris. Coming from an old pro, that’s very encouraging. I think for children’s books, it’s important to click through to the age ranges. The picture books have dropped by a few in the last 10 minutes that I’ve checked. These will range in age from: Baby-2, Age 3-5 and Age 6-8. The total number of children’s books includes many books that are not illustrated, so it’s not an accurate count on how many people are leaving that have illustrated work. Besides, from what I’ve read, I think many children’s authors have emailed KDP and they have responded that they are looking into the situation with children’s books. So many authors might be waiting to see what happens before they leave KU altogether. Those are good points. I do have the data for children’s categories, and will look at that closely at the end of the month. The numbers go both up and down as new books are published each day and authors opt out. Sometimes, there are publishing delays where for a period of hours the drops show, but the adds don’t. In addition to some authors hoping for Amazon to address illustrated children’s books, others are waiting for August 15, where they will feel better informed. Thank you for adding your great points. With regard to your figure for falling enrolments, I think it’s worth pointing out that Amazon’s fluctuating numbers are only a very rough guess. I’ve been watching them go up and down by several thousand, the lowest point after July 1st being around 997,000. It’s currently 998,934, but five minutes before that it was around 1,002,000. It’s as if they’re drawing the figures from different databases each time. The other interesting metric is how this compares with the numbers of books in KDP overall. It *seems* to be a shrinking percentage, but I don’t think we can read anything into the figures for at least a couple of weeks. There are several different ways of getting the numbers, and all aren’t equally consistent, and some don’t count them the same way. I’ve checked throughout the day in July, and it’s varied from 119k to 114k the last 2 days, 115 presently. My method has been fairly stable. But I will explore some of the other methods to compare them. Some of the sudden rises may be due to various publishing delays. Thank you for a data driven, intelligent look at this issue. I was a KDP Select author since publishing my first novel in December of 2011. Because of Select, I was able to quit my day job in October of 2012. Yeah, I made that kind of bank (6 figure income after year two.) Anyway, my income did decrease by 75% when they unrolled KU 1.0. I had to pull out of KU and try my hand at other platforms such as iBooks, B&N, and Kobo. I can say without any hesitation that no one treated me as well as KDP has. My sales on the other platforms were decent, but not enough to make up for the sphincter-prolapsing collapse of August last year. With that said, I’ve now put three of my older books back into Select. I did that on at around 2:00 p.m. on July 1. Since that time, I’ve had over 40,000 pages read. lol I do wish that was entire books sold! 😀 I look at KU as a rental service, not a retail sales service (thank you Hugh Howey). Two sets of numbers, One from when the program, one today. You can see who’s leaving the program. And you can guess why. That’s good info. About 5%. It’s also a popular genre to write in, and a golden opportunity for those who are looking for a possible hole to fill, which I suspect some will try to do. It will be interesting to track these numbers in the coming months. Eh. I don’t determine whether to enroll in KU based on how many other people are doing it. The mass exodus or lack thereof is irrelevant because a lot of people have no business sense and that has nothing to do with me. I suspect there are a lot of new books entering the system hoping to cash in on a longer length (good luck with that!). Generally speaking, if you base your business on KU, you live and die by Amazon’s sword…a lot of folks who invested heavily into KU1.0 are being cut to the bone now. I think the bigger issue is this–and no one is talking about it–none of the subscription models are financially viable. It’s been a year+ and Amazon can’t cover KU with reader subscription fees, they keep having to fund the whole thing. Scribd, apparently, can’t earn enough in fees to cover borrows. At what point has ‘proof of concept’ failed? And if they keep going without achieving profitability then the logical conclusion to me, is even more pay cuts and rationing of success. Subscription models are not going to end well for authors. I’m amazed at how many authors flock to KU as if it’s the promised land. Listen, authors are just cannon fodder for these business models. You can see that in the way Scribd jettisoned indies last week. You want to survive in this business, you’d be smart to not put your eggs in one basket. Or if you do, don’t cry when you get screwed. I’ll be among the first to say that the new KU doesn’t promote longer works. The only way it seems that way is when we compare KU 1.0 to KU 2.0. But that comparison is irrelevant. Looking only at whether or not to enroll in KU 2.0, it’s not length that matters, but reader engagement, and shorter books may actually have the edge there. KU 2.0 looks to be financially viable. Before, readers could zip through dozens of very short books, costing Amazon money. Now you’d have to zip through thousands and thousands of pages, push that 1.9B pages read to ridiculous heights, and that won’t be easy to do (and the monitoring system will likely catch those that try). Scribd’s model is much different. For Amazon, it could also be a loss leader, if necessary; Amazon has tons of other products to sell to customers who are used to shopping there. I don’t think it’s fair to assume that the money Amazon routinely added to the pot was necessarily to cover losses. It seemed pretty clear that they started the fund at 3M at first just to give them flexibilty not to commit too much too soon, and then it just turned into an unnecessary habit when the payout was near $10M. Since they are starting July and August at $11M, it seems that Amazon is comfortable with this payout based on the current number of subscribers. It could be a loss, and even if so, it may still have other compensation from holiday and gift shopping from subscribers, but I see no evidence that it is certainly a loss. I agree that one shouldn’t write with KU in mind. One should write with long-term goals and plans, prepared to adapt to a dynamic publishing environment. However, KU 2.0 rewards reader engagement, and authors who deliver reader engagement are likely to thrive whether or not they enroll in Select, and no matter where or how they publish. So focusing on reader engagement wouldn’t be a bad thing. Thank you for sharing your perspective on the new policy. I got about 1,30 before, I get 30 Cents for 100% reading now. There’s no way I’m going to prolong my book’s Amazon exclusivity and in fact, KU has become my main reason not to go exclusive on any book in the future. Any book long enough to earn out the difference between income from sales and from KU, I would never make an Amazon exclusive. So yeah, I’m pulling out, I just don’t go out of my way to make a run for it. Not worth it, because my only KU book is a media tie-in that was designed to only make money for a few weeks anyway, I just uncheck the automatic renewal and wait it out. Basically what I’m saying is: Your analysis just comes too soon to be meaningful. It’s been a mere two weeks since the announcement. You’re right. We’ll know much more on August 15. It would be frustrating to lose about $1 per borrow. Good luck with your books. One big problem with any interpretation of the data is that we have absolutely no information on the subscriber end of the equation; how many subscribers does KU have and how are they coming and going as things progress. It’s hard to really decide on the appropriateness of the program without knowing some hard numbers on that. I’m leaving my few titles in KU, just because it hardly matters either way with them, and the added promo layer of KU might bring in a few more sales ( or a few more quarters from the borrows) through reader serendipity. I think we all know that unless you are in KDP Select, your books end up being second-tier in the searches – not complaining, as it’s Amazon’s house and they can give out advantages however they want. That’s a good point. There are several variables. One is added or lost subscribers. Another is a change in reading habits (no longer worried about reading too many short books). Then there were groups abusing the program getting books to 10% without really reading them: Will they stop that entirely, or start “reading” 100%? The complexion of books available may change, and so may subscribers. August 15 is when we learn something definite. I don’t think there is anything directly against non-KU books with regard to visibility. There doesn’t have to be. The system as it is automatically favors KU books because every borrow improves sales rank, and all those customers searching and trying out books they otherwise wouldn’t help with search visibility. There is no doubt this is one of the hidden benefits of KDP Select. This info was almost more worthwhile to me than the paycheck. My goal has always been to build a reader base. I want loyal readers more than I want quick cash, so given that I intend to spend the whole of my life writing, I’m staying in. That is a very significant distinction. A great blog post to balance the media hysteria surrounding the new payment scheme for books borrowed through Kindle Unlimited. I’m not a publisher but I wonder how this will affect publishers. I used to buy maybe 5 books per year and I borrowed 20-40 books per year from the library. Ever since I started my Kindle Unlimited subscription I’ve borrowed 100% of my books from Amazon, or a total of 8 books so far. As a consumer, I love this system. I think it’s better for publishers than having people borrow the books from libraries because they can’t afford $10-$20 books on a regular basis. But then again I don’t know the specifics but it’s good to see these points from the other side. Male, Born in Manchester, England in 1944 now living in Germany. At the start when I uploaded my 30+ e-books on amazon, I was, in my opinion, doing moderately well with my cash sales; then I joined kindle and my sales doubled, but not all the royalties; 40% dropped from 75-35% to 12%, but as long as readers were happy so was I. Then, along came amazon with a gret idea how to earn more money … er, for amazon, not the authors. I called it the pages-read-scam – for that is what it was, a way to line whatsisname’s pockets and I told kindle so. I seem to have lost readers, my only book that is still selling and selling porly – very poorly, is a tale of the holocaust, a true event built up with the help of the son of one of the characters. I write fiction only, I’m self-educated at 71 years of age. I’ve just finished ghost writing a five book series for a friend in the USA (I live in Germany.My genres are crime. sci-fi and a mixture of both and I write under the name T. J. Edison along with (occassionally) my daughter Ellen Dudley. Thank you for sharing your experience with Kindle Unlimited; I’m sorry it hasn’t served you well. Even without Kindle Unlimited, in general, it’s difficult to maintain sales momentum without constantly releasing new titles and continued effective long-term marketing strategies. That is, sales typically decline all on their own, especially with tens of thousands of new books published each month (and the majority of those appearing in Kindle Unlimited). Personally, Kindle Unlimited has been good to me. I interact with many authors, and see some who are thriving in Kindle Unlimited, but also some whose books are struggling in it. For those who aren’t in Select, again I find some who are thriving outside of Select, but also those who are struggling out of Select. On average, I find more who are doing well in Select than outside of it, excepting those who have already built big names (with a few exceptions to those rules).